Outrage ramped up on social media amid a controversy over racial slurs at a Wells-Lisbon High football game and the longtime dispute over Skowhegan High's mascot. SKOWHEGAN — The Skowhegan Area Chamber of Commerce has issued an apology and withdrawn a holiday business promotion it called “Hunt for the Indian” after a weekend of social media outrage lambasting the effort as racially insensitive. 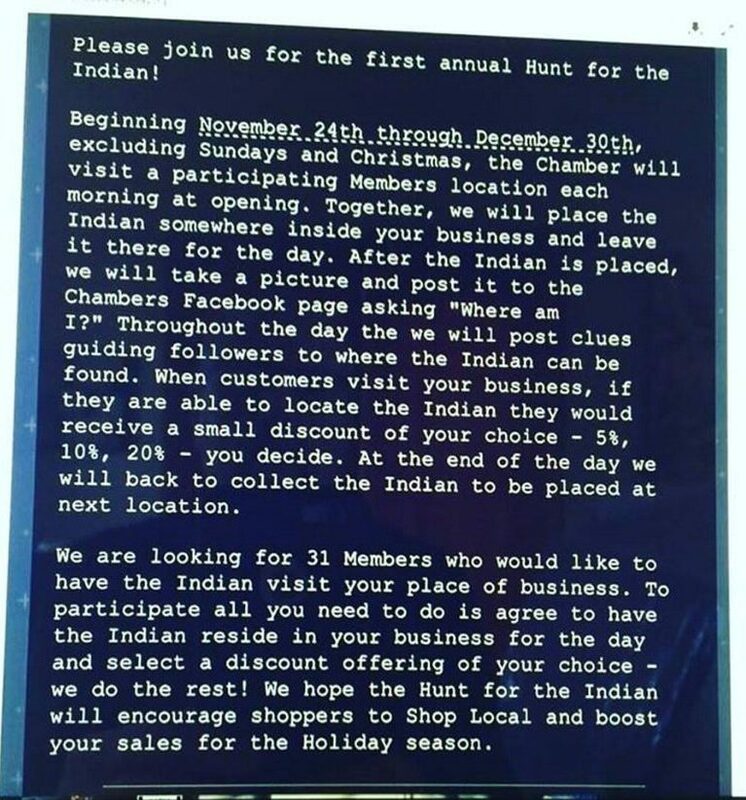 The promotion, announced in emails sent Saturday morning and slated to run Nov. 24-Dec. 30, asked chamber members to join them in placing a small “Indian” figurine inside one of their businesses each day. A photo of the figurine in the store for that day was to be posted on the chamber’s Facebook page along with clues about where it could be found by shoppers, who would receive discounts on merchandise if they found it. The figurine would be removed at the end of the day and placed in another business the next morning. The Skowhegan Area Chamber of Commerce promotion was emailed to members on Saturday and met with outrage on social media.Residents quickly took to social media decrying the promotion, with one saying the effort was “heaping disgrace” on the town. And even as the chamber apologized for the abandoned effort, board members gave contradictory statements on Monday about who was involved in the decision to do the promotion. “I think this just shows how far away we are in terms of the understanding some people have on not only the history of Native people in this state but also that we are very much present and functioning here today,” Francis said in the email. “This is a prime example of not seeing Native people as real, and we are not just something of the past but functioning members of today’s society. These types of activities create a mindset that fuels the minimization of Native people. The Skowhegan Indian landmark sculpture in downtown, made by artist Bernard Langlais, is owned by the Skowhegan Area Chamber of Commerce. The promotion follows a recent separate controversy involving racially sensitive behavior when the mother of a Micmac Indian who plays football for Lisbon High School alleged that fans and players mocked Native Americans with offensive stereotypes during a football game at Wells High School. 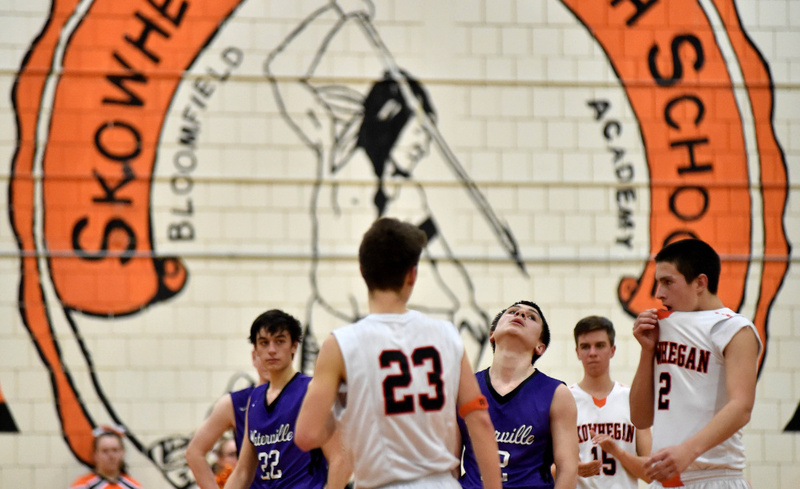 It also comes after years of debate about Skowhegan Area High School’s use of an “Indians” mascot for sports teams, culminating in a May 2015 vote by the school board to keep the nickname for sports teams despite opposition by Native American tribe members. 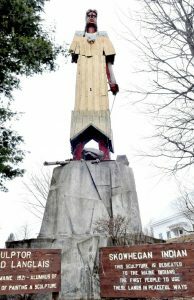 The Indian figurine that was the object of the hunt was to be a small, 4-inch wooden replica of the 62-foot-tall Bernard Langlais sculpture, which is owned by the chamber, erected and dedicated in 1969 in downtown Skowhegan to honor local tribes. Despite the apology, the chamber leadership on Monday wouldn’t elaborate on who decided to run the promotion. The chamber website had earlier listed its 2017 board of directors as: Danielle Denis, president; Kate Mantor, vice chair; Dana Hamilton, 2nd vice chair; Travis Works, treasurer; Elizabeth Barron, secretary; Cathe Ayres, member at large; Vanessa Quinn; and Brenda Washburn. By Monday afternoon, the list of the directors’ on the chamber’s website was blank. Chamber Executive Director Jayson Gayne and Denis said in a meeting Monday that the idea for the promotion was hatched by the full chamber board of directors and was not a unilateral decision by any one person. Denis said she wanted Monday’s news to be “part of the solution” and that “pointing fingers” would not bring people together. But Mantor, the vice chair, said in an interview that there was no vote on the “Hunt for the Indian” promotion by board members and she didn’t know about the promotion beforehand — undercutting the assertion that the full board of directors was involved. Otherwise, Mantor and board member Works, who said he had missed a couple of meetings and did not weigh in on the promotion, said they would stand by what Gayne and Denis said Monday morning about the promotion. The Indian figurine that would have been used in the holiday promotion is much like the Elf on the Shelf promotion sponsored by Main Street Skowhegan. Maulian Dana, a Penobscot woman from Indian Island who has spearheaded the local “Not Your Mascot” movement to get school officials to stop using the “Indians” nickname for high school sports teams, said Monday that the chamber promotion controversy might actually work to trigger a second look at the mascot issue by the school board. Maulian Dana said the Langlais Indian sculpture near downtown Skowhegan has become a rallying point for another group called the Skowhegan Indian Pride Facebook group, which is closed to non-members and states it has 1,400 members. That group and others are holding fast to their belief that keeping the Indians mascot name is their heritage and their way of channeling the power and strength of the people who first settled on the banks of the Kennebec River, which runs through Skowhegan. But Dana, whose father, Barry Dana, a Penobscot elder and former tribal chief, and other Native people disagree. “Sports team mascots and other imagery … are offensive to and objectify Native people,” Francis wrote.